Cleaning dog ears takes only a few minutes, but it can prevent common dog ear problems like ear infections and dog ear mites. While some vets recommend daily dog ear cleaning, cleaning dog ears just once a week, will help to keep your pet’s ears healthy. Weimaraners and other dogs with floppy ears are especially prone to dog ear problems. Because their droopy ears block off air circulation to the inside of their ears, they often develop yeast and bacterial infections or ear mites. Your Weimaraner’s ears need to be cleaned regularly. Your dog’s ears produce ear wax, just like yours. And his ears can trap dirt, grow hair and retain moisture—conditions that make them especially prone to dog ear infections. In addition, Weimaraners who hunt, can pick up dirt and natural materials that get caught in their ears, as well. 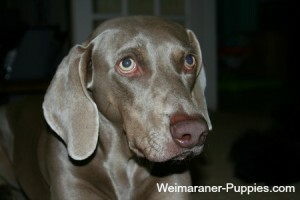 Occasionally a Weimaraner who hunts or spends time outside, will get something like grass seed in his ear. You can often remove this carefully if your dog allows you to handle his ears. When cleaning dog ears, you should make a quick but important examination of your dog’s ears, to make sure that they are healthy. • Dog scratching ears – this is a sign that something needs to be addressed. Your dog’s itchy ears can mean anything from built up wax to infections or dog ear mites. • Lots of ear wax – some ear wax is normal and healthy for dogs, but lots of ear wax that looks reddish brown or streaky, or ear wax that smells, is not normal. • Hair inside the ear – hair in your dog’s ears blocks air flow and catches dirt and wax. It also provides a moist area for fungus or bacteria to grow in. • Parasites – Check for ticks and fleas. And your dog may have ear mite parasites if you see little flecks or specks. • Smelly dog ears – your dog’s ears should not have a foul smell. If they do, they may be infected. 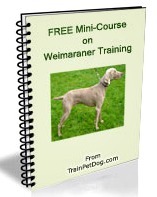 You need to clean both the inside and the outside of your Weimaraner dog’s ears. Gather the things you will need, before you sit down with your dog. Blunt tipped scissors – Use this kind of scissors when cleaning dog ears and trimming delicate areas–especially if your dog is prone to move quickly or become startled or afraid when being groomed. Cotton pads (not cotton balls) or Dog Ear Wipes – Ear wipes are convenient for cleaning dog ears and they do remove wax. Keep a container of these in your truck for quick ear cleaning after hunting or a romp in the woods. Dog Ear Wash with Tea Tree Oil – this particular ear wash has tea tree oil. It helps to remove ear wax and dirt, and it’s a great dog ear care product to use after your Weimaraner has been swimming. Dog Ear Mite Relief Product – Since Weimaraners do tend to have ear mites, infections, etc., you would be wise to have this kind of product on hand. Using it will save you a trip (and the expense) of going to the vet. You should not use Q-tips or alcohol when cleaning dog ears. Q-tips can damage your dog’s ear drum, and alcohol can dry out the inner ear too much. Hold your dog’s ear up with one hand. With the other hand, gently wipe away any dirt and wax under the ear flap. You can use a cotton pad dampened with dog ear cleaning solution to do this. You will see lots of nooks and crannies in your dog’s ears. Gently wipe them clean, making sure that you don’t push dirt further into the ear. Keep cleaning these areas until you don’t see any more dirt or wax on a clean cotton pad. If there is hair in your dog’s ears, remove these hairs with tweezers, one or two at a time. Removing more hairs at a time can be really painful! Dog Ear Powder makes this easier, as it makes the hair easier to grip. Now you have to clean the parts of your dog’s ears that you don’t see. You are NOT going to put any objects into your dog’s ears, as they could damage her ears. Gently squirt some of the ear cleaning solution into your dog’s ears. Be careful to squeeze gently and keep the tip of the bottle, in the outer portion of the ear. Your dog’s ear drums are delicate, and you want to be sure that you don’t damage them. Now massage your dog’s ears, right below the ears (on the outside), where they attach to your dog’s head. This will help the solution reach the inner ear before your dog shakes her head and shakes it all out. The ear wash solution will bring wax and debris up to the outer ears, where you can wipe them clean with cotton pads. That’s all there is to cleaning dog ears! If you do this routinely, your dog’s ears will be cleaner and healthier—and you’ll have fewer trips to the vet.